Queen Composter is rethinking the traditional new year resolutions. It's the new year and my Facebook feed is full of inspirational quotes and resolutions for starting the year well. But like Neil deGrasse Tyson, I won't be making any resolutions. We have all had to make resolutions in January when we were in school, which we know almost immediately that we wouldn't keep. Then we feel bad about ourselves for not keeping the resolutions. Unless there has been a genuine shift in thinking and attitude, and we are able to make a change in behaviour a habit, we do not follow through on our goals. Instead, I think we should be focussing on all the positive actions we have done for the environment over the previous year, like a reverse resolution. Most likely we are doing more than we realize, and this is important because we can get bogged down in all the things we should be doing. I've brainstormed as many actions that I can think of that we may have done in 2014, and if you have made even five items on the list a habit give yourself a pat on the back for a job well done. Keep up the good work for 2015! 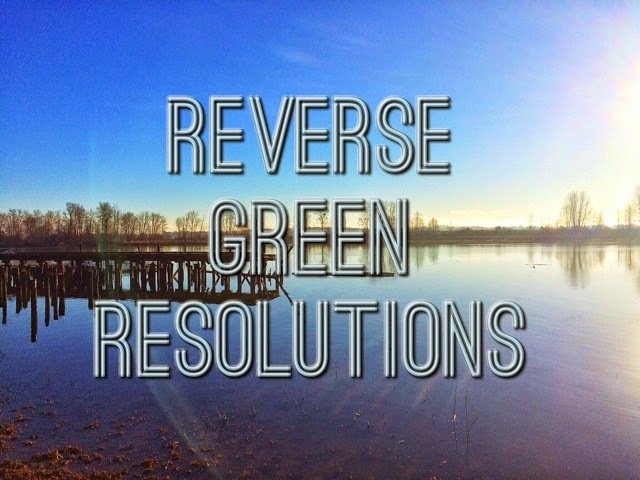 What else can you add to the reverse resolution list? I was looking over your list and felt really good because there were quite a few on there that we have accomplished. I also see where we can improve. Really good post! Great idea! I'm all about building on the positive. Love that you referenced Neil deGrasse Tyson. Thanks, as always, for the inspiration! Packaging is a nemesis for sure! Hear hear hear! I love the idea focusing on what we've accomplished and resolving to keep it up.